When it comes to falling seriously behind on loans, black families face a disadvantage before they even step foot inside a bank, a new report from the St. Louis Federal Reserve finds. 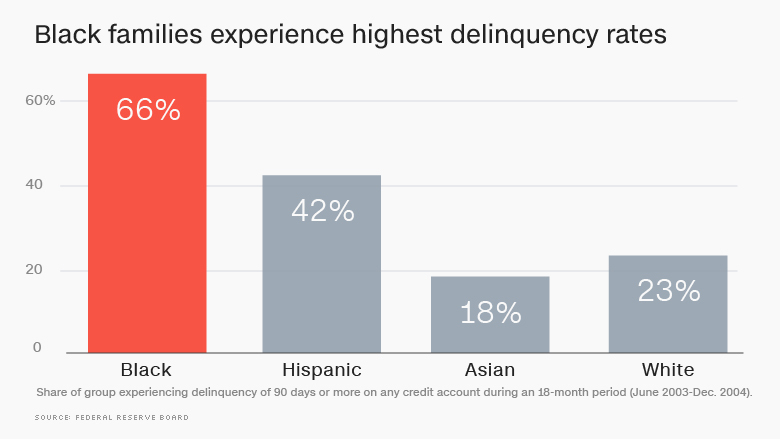 The study found that black families experience the highest delinquency rates and are more than twice as likely to be seriously delinquent on a loan as white families. Meanwhile, Hispanic families are one and a half times more likely to be 90 days or more behind on their payments. Asian families, on the other hand, had better delinquency rates than whites, the report found. 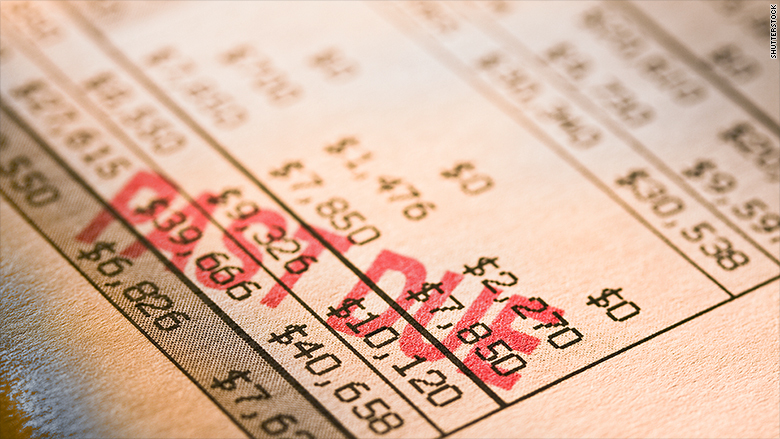 The findings were part of an analysis of 41,000 responses to the Survey of Consumer Finances conducted over the past 25 years by the Federal Reserve Board and the U.S. Treasury Department. The analysis aimed to examine a general assumption that high-risk borrowers -- blacks, Hispanics, the young and the less-educated -- regularly employ bad choices and risk-taking behaviors when taking out loans. Researchers found that historical circumstances -- rather than bad choices or risky behaviors -- play much more of a role in predicting whether a borrower may end up in serious delinquency. For blacks, for example, the legacy of slavery often means they come from a family that started with zero savings while white families had been accumulating wealth for years, explained William R. Emmons and Lowell R. Ricketts, the authors of the report. Add in decades of discrimination in education, housing and the workplace and the ability to build up a solid financial base and expertise becomes increasingly difficult, explained William R. Emmons and Lowell R. Ricketts, the authors of the report. A similar scenario plays out for Hispanics, many of which are immigrants or children of immigrants who started out with very little wealth and unpredictable sources of income, they said. "Black and Latino families may start their financial lives at an inherent disadvantage," the researchers wrote in their report. To arrive at its findings, the bank stripped out "bad choices" -- such as taking out a large loan with a high interest rate -- in order to more fairly assess the different demographic groups. The fed found that if financial choices and exposure to good luck -- such as receiving an inheritance -- were equal to white families, Hispanics would be just as likely as whites to miss payments but for blacks it showed only marginal effects, according to ther authors of the report. Families with a four-year college education or less were also more than twice as likely to miss payments than those with post-graduate degrees, the researchers found. Young families headed by someone under 40 years old were also more prone to fall behind on payments. Here too, the bank found that it was the financial circumstances that these families face -- and not a higher threshold for taking on risk -- that leads them to fall behind on their payments. This group has relatively little financial experience or savings, they earn less and they tend to have more volatile incomes, the researchers said. "One cannot simply choose to enter adult life with student loans paid off, money in the bank to pay for a house and car, and the accumulated financial know-how of a lifetime of learning by doing," the bank said. "Families with 'delinquency-prone' demographic characteristics -- being young, less educated and nonwhite -- did not choose and cannot readily change these characteristics," the authors of the report said. "We should refrain from adding insult to injury by suggesting that they simply have brought financial problems on themselves by making risky choices."